Beautiful and plush. Extremely soft and durable. It’s very light weight since it has a faux hide backing. Love it! i may order a second for the downstairs. 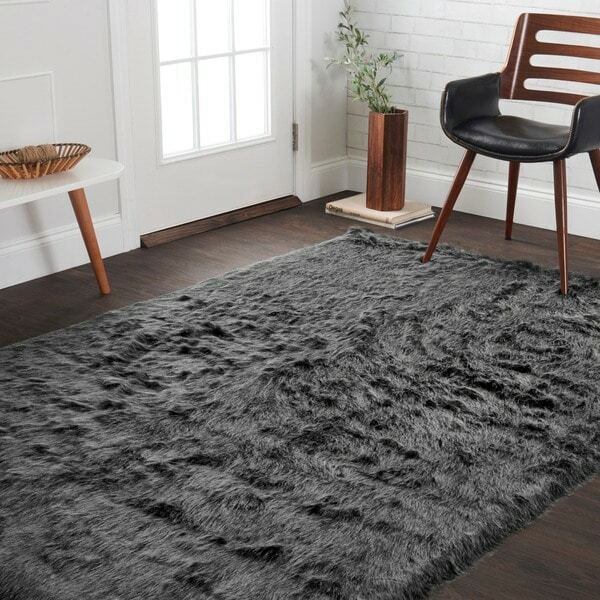 Faux Sheepskin Grey Graphite Shag Area Rug - 5' x 7'6"
This Martin rug from Silver Orchid is a beautiful example of the comfort and hip style that a plush shag rug can offer. The Martin features a rich two-tone charcoal color that will be a great accent piece in a bedroom or living room. I love this rug! Super soft and nice quality. The color is remarkable as well. This was exactly the kind of rug we were looking for to put under our dining room table. I highly recommend this. Well worth the money! Coz it looks nice and soft!!! "Can it be washed in the washing machine on gentle?" Professional cleaning is best. For home upkeep, shake dry dirt free. Spot clean spills with a clean dry cloth and mild detergent specifically made for carpet and rug care. Always test detergent before using on larger areas. Avoid rubbing pile vigorously. Try to blot dry. Gently comb fibers with fingers and let dry on flat surface. We don't recommend washing in a machine washer. "Is this rug black or grey toned. Colors are so off on most overstock pictures. Trying to make sure I know what I'm getting"
Overall, it is a dark grey rug. The black fibers have dyed tips of light grey. The two-tone combination creates texture and a realistic fur look, but an overall dark grey color.